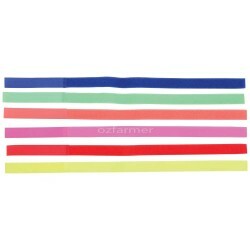 Hook and loop type nylon bands for quick and easy calf identification whether for identity at birth or for signifying treatment with antibiotics or sulphur drugs. Also useful for marking different age rearing or treatment groups. Highly visible neon colours. 59cm long. 2.5cm wide. Pack of 10 only. Available in single colours or a pack of mixed colours.